Most of our customers choose to add a custom deck to their home for additional living and entertaining space. 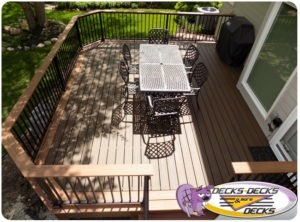 As a custom deck builder, Decks, Decks and More Decks designs each deck with the customer’s priorities in mind. So, when our custom deck designers hear you don’t want to regularly stain your deck – we suggest low maintenance decking material. When we hear you want to make space for a spa – we strategically design the deck for ease of use and extra weight. And when we hear you want to entertain your closest friends for regular summer celebrations – we recommend a drink rail to make guests comfortable and increase flexibility with space. When our low maintenance and maintenance free decks are paired with high performing drink rails, entertainment and living value increases. Railings today feature many options for design and boast recreation value you’ll continue to enjoy year after year. So, during your summer BBQs, go ahead and tell your guests to put their drink down – and rest easy that it will be safe and study on a custom drink railing. Give our Omaha deck builders a call to find out how a custom deck can enhance your summer entertainment. This entry was posted in Custom Decks Omaha and tagged Custom Deck Rails, custom decks omaha, deck building omaha, decks omaha on November 29, 2017 by Decks, Decks and More Decks.